It’s also one my favorite parts of the weekend. I love the gentle pace that comes along with it, the rituals behind it (for us: tea, then more tea), and the stretch of the day ahead. It’s comforting. It’s warm. It’s that place where you want to sit and stay awhile. Aside from eggs in all forms (omelet for Suraj, scrambled for me), we gravitate toward Indian breakfast items. 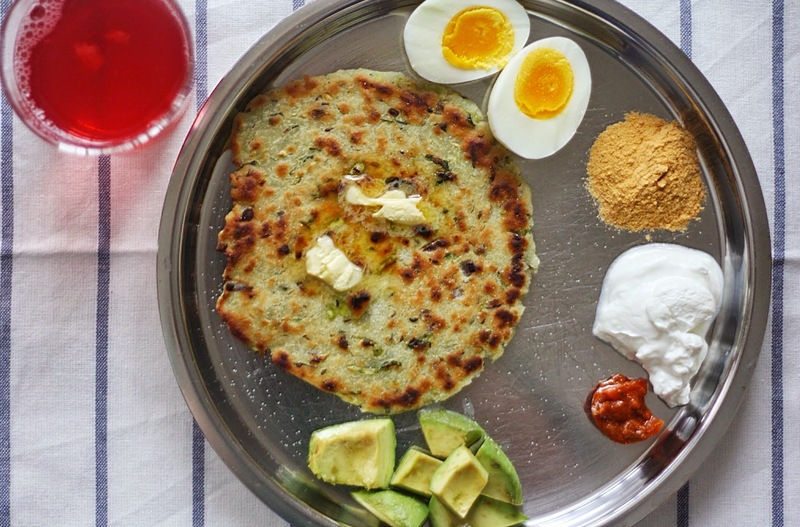 Dosa/iddly, poha, and savory pancakes like moong dal cheela and cucumber roti (recipe below) are our top picks. I think if I ever actually wrote a cookbook myself (aside from just hiring people to do it), it would be on Indian breakfasts. There is just SO much to love when it comes to this cuisine, this meal. Wholesome ingredients, a light touch of spice, veg-centric, filling-but-not-coma-inducing (and often fermented, like dosa)—addicting, in a word. My “to blog” list includes dozens of these recipes, and I hope to one day share them all here (check out my Instagram in the meantime for photos of most of them, and proof that I am in fact obsessed). Our weekend breakfasts all take more time to prepare than pouring a bowl of cereal, but that’s what I like about them. I like listening to Sunday Morning while pulling things together, and having Suraj come join me to finish the tea while I take things off the stove, or cut up some fruit. When we sit down together, we’re both relaxed, but hungry, and can look forward to a warm meal in front of us, and the day ahead. In the case of this cucumber roti, or flatbread, it’s one I posted about to friends on Facebook a few weeks ago, when I was once again waxing poetic about this very subject (I’m fast becoming a broken record, aren’t I?). A few people asked for the recipe, which I’m more than happy to share here. It’s rather easy to prepare, gluten-free by nature, and full of flavors that work beautifully together (cucumber, coconut, rice, cilantro). The cucumber and coconut help keep the interior soft and subtly sweet, while the outside crisps up in beautiful contrast—it’s a savory pancake/flatbread like no other. I hope it finds its way into one of your weekend mornings. This savory flatbread is made simply from grated cucumber mixed with rice flour, coconut, and a few spices/herbs (cumin, cilantro, chili). There is no water or other liquid added; the cucumber itself hydrates the dough. It is light on the stomach, yet filling at the same time. You can find grated, frozen coconut at any Indian grocery store. It’s pretty cheap, requires no prep, and tastes amazing; I just defrost it in the microwave for about 45 seconds. If you can’t find it, you can use unsweetened, dried, shredded coconut—just soak it in 1/2 cup of hot water for 20 minutes or so, then add it to the dough along with the soaking water (I haven’t tried this personally, so you may need to play with the water ratio). Combine all the ingredients (except for the oil and butter) in large bowl. Don’t add any water, just start kneading it all together with your hands. As you work, the moisture from the cucumber will start releasing and hydrate the flour. After a few minutes, it should start coming together into a ball and feel like play dough. If it still feels too crumbly, add a couple of drops of water and keep kneading (I’ve never had to do this, but if you had a small cucumber, maybe you’ll need to). Divide the dough into equal portions, making each one about the size of an orange. Working with one piece at a time, place on top of a sheet of waxed paper and press down with your fingers to flatten to about 1/4 inch thickness. You may need to wet your hands with a little water if they’re sticking. Conversely, you can lay a second piece of waxed paper on top of the dough (flattening slightly) and gently roll it out with a rolling pin (or use a tortilla press). Heat a cast iron pan or skillet with a few teaspoons of coconut oil or ghee over medium heat. It’s hot enough when a drop of water sizzles. Gently transfer the roti to the skillet; I do this by taking off the top sheet of waxed paper (if using), then picking up the whole thing by the bottom piece of waxed paper and flipping it over onto the skillet, so the waxed paper sheet is now on top—I then quickly and gently peel off the top paper. Cook for 4 to 5 minutes on each side, until lightly browned in spots. Remove and serve hot with butter and a sprinkle of salt. We like to have ours with hard-boiled eggs, avocado, Greek yogurt, Indian pickle, and chutney. If you have any leftovers, just keep them in the fridge and reheat in the toaster. They make a great weekday breakfast this way!